Geeba plans to use blockchain technology to improve the speed of e-commerce deliveries and ease the burden on urban infrastructures. Blockchain technology is often touted as a world-historic shift in how we organize information, conduct economic transactions, and even our political structures. Yet, blockchain also has many less dramatic applications that fall short of fundamental social transformation. These practical applications still make a positive contribution to the social good. Many sectors of the traditional economy have segments in which blockchain technology could be hugely helpful in increasing efficiency, reducing waste, and easing pressure on urban infrastructures. One of these is known as “last-mile” delivery. The phrase “last-mile” refers to the final segment of a freight delivery journey, where parcels are transported from a distribution hub or warehouse to an end consumer’s location. Last mile delivery is an expensive and resource-intensive segment of the e-commerce and freighting markets due to a lack of flexibility in the supply chain. This lack of flexibility comes from two sources: 1) the monopoly of a few big companies that often rely on local subcontractors 2) the use of outdated technologies. One consequence of these factors is higher costs to consumers and businesses. However, there are much broader social impacts beyond costs to customers and businesses. Urban freight vehicles, like cars and trucks, have a significant impact on the environment and the quality of life in cities. In Europe, for example, traditional freight transport accounts for 6–18% of total urban travel, 9% of energy use, and 21% of CO2 emissions. These numbers can be expected to rise even higher in the near future as the popularity of e-commerce continues to grow. A study from Barclays estimates that in 2013, products ordered online generated just over one billion deliveries. By 2018, this number had grown by 28.8% to 1.35 billion. This means the pressure that last mile delivery puts on urban infrastructure and the environment is increasing. The result is an urgency for new and innovative approaches to last mile delivery that go beyond offering cost savings to businesses and consumers, though this is an important factor. Addressing what appears as inefficiency from an economic perspective will contribute to the social good in more profound ways, such as easing pressures on urban infrastructure and helping the online shopping industry grow in a sustainable way. I recently came across one interesting startup that is hoping to achieve these goals. Geeba is a decentralized delivery ecosystem that enables businesses to operate deliveries with blockchain technology using autonomous vehicles (droids and drones) and smart hubs. Geeba is a joint venture between Doha-based autonomous vehicle logistics company Airlift and n-Gon, a company specializing in applications for UAVs (unmanned aerial vehicles). Airlift provides the autonomous surface vehicles, N-gon supplies the drones for transport through the air, and the newly-formed Geeba develops the blockchain technology that will connect the autonomous vehicles through an online platform. Geeba uses blockchain to add transparency and predictability to logistics operations, and ultimately to accelerate the physical flow of goods through more automated and error-free processes. With their system, driverless cargo bikes (droids) and drones in the sky will pick up cargo from a smart hub and then deliver it to customer doorsteps. In contrast to the subcontractor model, Geeba wants to create a community-driven network of decentralized distribution hubs within its areas of operation, which will be incentivized by a portion of delivery fees. 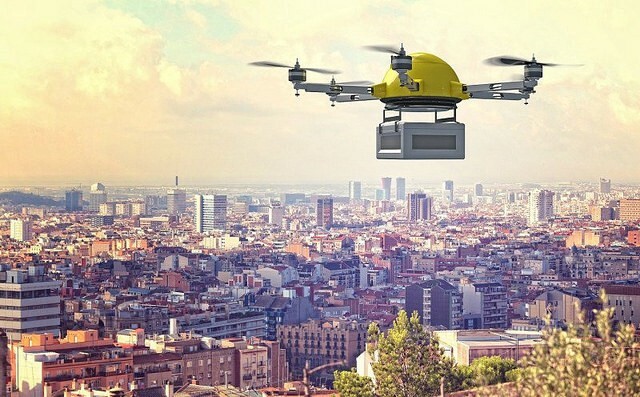 Each of these “smart hubs” will serve as a local base for a delivery fleet (drones and/or droids, depending on the locale and terrain), with the entire exchange — order, confirmation and verification of delivery — recorded and stored on Geeba’s blockchain. According to Geeba, this will solve many of the problems associated with last mile delivery within cities and cut the expenses for e-commerce companies significantly. Last-mile delivery is an example of one of those sectors of the economy that is ripe for innovation. Blockchain technology provides the tools to do just that. Geeba’s plans are ambitious and the startup has wisely chosen the Netherlands to incubate its ideas as the government in Holland is especially encouraging of startup experimentation. The technology and pilot will be developed at the Cambridge Innovation Center in Rotterdam and the platform, smart hubs, and driverless vehicles in place and ready to deploy across the Netherlands by 2020. Subscribe to my channels Medium and Twitter if you would like to be informed about blockchain and cryptocurrency projects. How Blockchain Can Improve Life in Cities and Reduce the Cost of Deliveries was originally published in Hacker Noon on Medium, where people are continuing the conversation by highlighting and responding to this story. Next PostNext Graphs at Work. At school. And in other places, too.